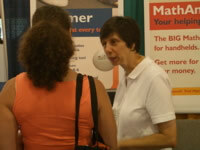 I stopped by the Valiant booth at NECC and eavesdropped as Nancy Kokat explained her company's Palm OS product, MathAmigo, to a group of interested educators. MathAmigo is for grades K-8 and features software to manage over 600 core math activities students complete on handhelds. Nancy explains how MathAmigo is an effective tool to differentiate the activities students do. The software can be set up to be used in a one-to-one environment or shared among students on one handheld. After students finish an activity, a complete assessment report is available to the teacher. I've tried an earlier version of MathAmigo and the management software was too time-consuming to learn. Nancy tells me there is a new version of the software that is much more user-friendly. MathAmigo has great features and student activities, but it does come at a premium. According to the website, an example price for 15 users is $495 per grade level (pricing varies depending on many factors and you may be able to get a special discount). Currently you must use a Windows computer to install and use MathAmigo on Palm-based handhelds, including the AlphaSmart Dana. The site says a Windows Mobile version will be available in 2004–looks like they missed that deadline. Additionally, Nancy tells me that a Macintosh version of the management system is in the works. Click here to listen to the recording (3 minutes 21 seconds).